The decks are done. Mostly. After the caulking was done, the guys pulled the tape and very lightly sanded the planks just to knock off the remaining silicone. 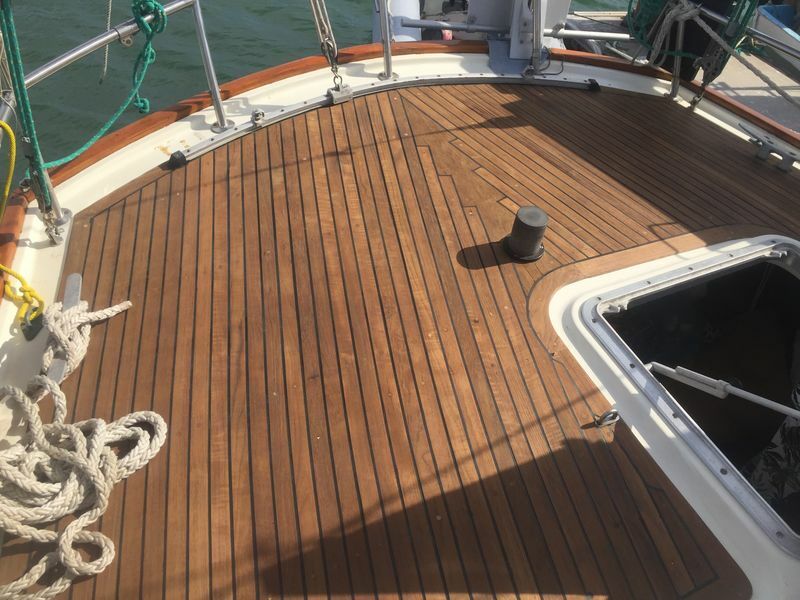 We specifically did not have them sand down to smooth teak, since we were trying to preserve as much wood as possible so that they would last a good long time. About 160 screws were pulled because the bungs had popped. About a third of them were replaced with shorter screws, and the rest with just epoxy. In all cases, a new bung was put in, then shaved off with a chisel and sanded smooth. I anticipate more bungs will pop as we go, so it will soon be my turn to replace them. Since the wood is 35 years old, and thinner than it was, we decided to put on a lightweight sealer to help protect the wood against UV. A couple of times we have run into people who have used the product, Semco, and they have been happy with it. One aspect we like about it is there is no downside if we decide to discontinue using it. There is no flaking product like varnish if you don't keep it up. Other than the price and a bit of effort, there doesn't seem to be any downsides, at least that we have read about or heard about. 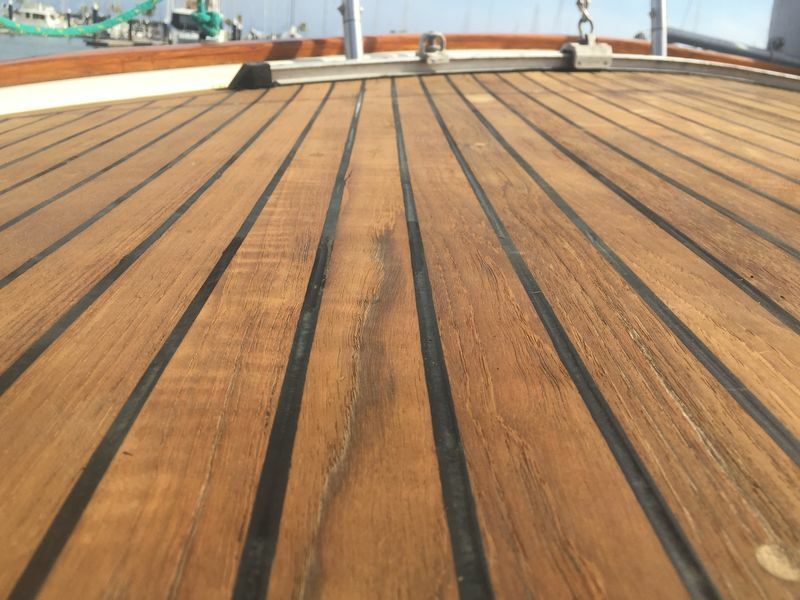 Dirt doesn't stick to it, water still absorbs into the teak, and the teak remains grippy. 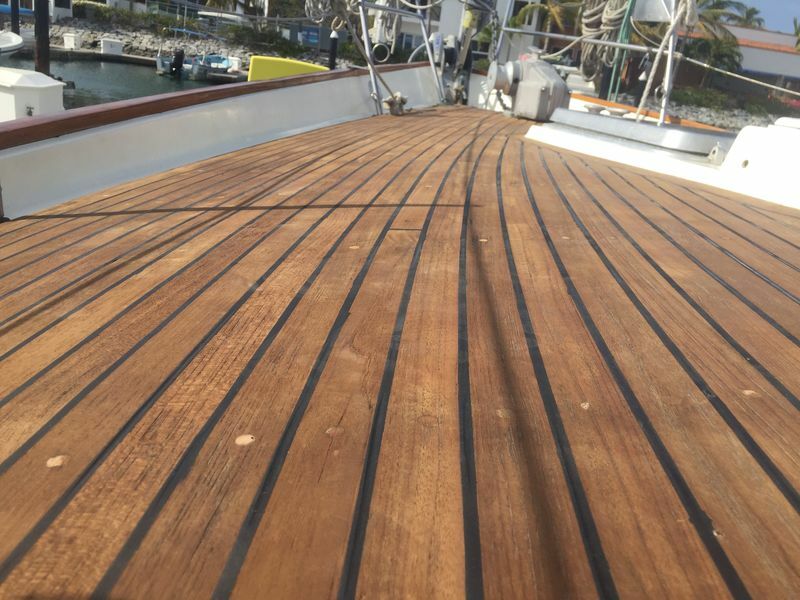 Unfortunately the guys applied it a bit thick, and ran out of the product before they could get two coats on all of the deck, so one section has just a single coat. Oh well, that is about par for the course on this boat. We are fortunate to have such a good deck model. 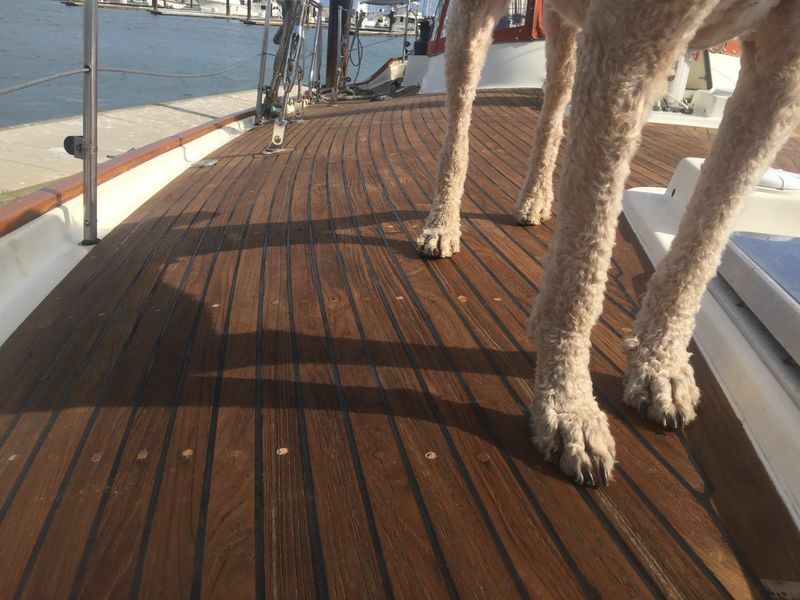 Look at how well Biscuit is gripping the deck! That dog is going no where! On the right side of the photo is a plank with a bit of grey in the middle, a result of going light with the sander. That is just what we wanted. It doesn't look "pretty" or new, but neither do I. All in all we are pretty jazzed. I look forward to not slipping on proud caulk, and not worrying about water ingress, which we never did find, fortunately. Next up, we will stay in La Cruz for a week-ish, then cross over to Cabo San Lucas to check out of Mexico, a three day sail, then up the outside of Baha and back to the US of A. But look, our plans change with the winds, so ask us tomorrow what we are doing and maybe I'll know.